When you open the box, you get a subtle vanilla aroma. When you take your first bite with milk, the vanilla still seems very subtle. You realize that you're eating a pleasantly sweet cereal. Then you take you're second bite and something wonderful happens... the vanilla flavor seems to increase. By the middle of the bowl, if you're like me, you are really digging Island Vanilla cereal. 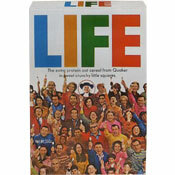 The cereal pieces look larger on the box than they are in actuality. They're similar in size and shape to Frosted Mini-Wheats Bite Size cereal. The lack of any frosting might keep some cereal lovers away from this one... but it shouldn't. This cereal is just as sweet and flavorful as most varieties of Frosted Mini-Wheats. In fact, vanilla flavor is so prominent... when you're done eating you're left with a pleasant vanilla aftertaste. Generally speaking, most anything called an aftertaste is undesirable. But when it's like a creamy vanilla candy, you could do much worse. All things said, I'd recommend trying this cereal. Most cereals that have vanilla in their name are surprising short on vanilla. Not this one. With Island Vanilla cereal you actually feel like you're on an island made of vanilla, floating down a vanilla stream, and... okay, okay... I didn't love it that much... but it's pretty good. Nutritional considerations: A 27 biscuit (1.9 ounce) serving of Island Vanilla has 180 calories, 1 gram total fat (0 saturated; 0 trans), 6 grams dietary fiber, 44 grams total carbs, 9 grams sugars and 6 grams protein. Iron (at 8%) is the only significant listing under vitamins and minerals. What do you think of Island Vanilla? The cinnamon harvest is the better one in my opinion, this one wasn't bad... but not what i was looking for. The vanilla is strong-if you eat it without milk or somehow manage to scarf it down before its been in the bowl with milk about 30 seconds to a minute, after that....the yummy flavor disappears-not bad.. but not my favorite. Honey Sunshine by Kashi is by far their BEST cereal ever, i highly recommend it. This stuff is alright. It's basically Autumn wheat which is amazing. So I cant say its bad, but just disappointing. I was hoping for a real pop of vanilla and it just didn't have it. Needs more vanilla, needs to stand out more; like its "cinnamon harvest" counterpart So I mean, its good, but just get Autumn wheat. 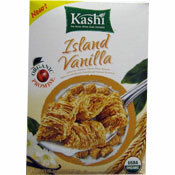 Kashi makes the best tasting cereals! My favorites would either be Strawberry Fields or Cocoa Beach Granola.